Be unwilling to accept the opportunity costs associated with not having these conversations skillfully. 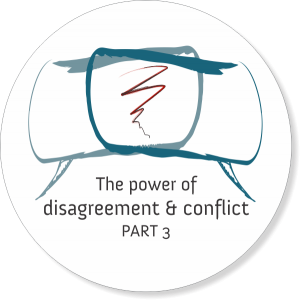 Even while most of us are uncomfortable with the challenge of conversations involving disagreement and conflict, we also recognize the potential benefit of having such conversations skilfully. Quite simply: some conversations involving disagreements can make us smarter. We have the benefit of more than one mind’s perspective factoring into our plans and approach to situations. We learn about what is important to our conversations partners. We can clarify and sharpen our own thinking and ideas by engaging in the back and forth with a conversation partners who sees things differently than we do. In a recent TED Talk, Margaret Hefferman provides a brilliant example of how constructive disagreement is in fact a high-leverage collaboration strategy. She tells the story of a doctor, Alice Stewart, whose work has had a positive benefit for almost all of us. She discovered that X-rays are bad for unborn babies, and hence should be avoided for pregnant women. It may surprise you that, despite very strong evidence, getting this finding to inform medical practice required quite a fight, one lasting several decades. Hefferman describes one of the great assets that Alice had in her quest to influence medical practice: A partner whose role it was to disagree with her. Here’s how Hefferman describes their relationship. “Well, she had a fantastic model for thinking. She worked with a statistician named George Kneale, and George was pretty much everything that Alice wasn’t. So, Alice was very outgoing and sociable, and George was a recluse. Alice was very warm, very empathetic with her patients. George frankly preferred numbers to people. But he said this fantastic thing about their working relationship. He said, “My job is to prove Dr. Stewart wrong.” He actively sought disconfirmation. Different ways of looking at her models, at her statistics, different ways of crunching the data in order to disprove her. He saw his job as creating conflict around her theories. Because it was only by not being able to prove that she was wrong, that George could give Alice the confidence she needed to know that she was right. This example points to the opportunity cost of NOT being able to engage skillfully in disagreements: Lower quality thinking. Look around you; look at your team, your organization. What are the conversations that are not happening, that, if you were to have them skillfully, would enhance the quality of your thinking. What will be the impact on your collective intelligence if you can skillfully engage more voices and perspectives – also the dissenting ones – in your thinking about how to approach challenges and opportunities? Previous post: Discomfort with disagreement is not a character flaw!